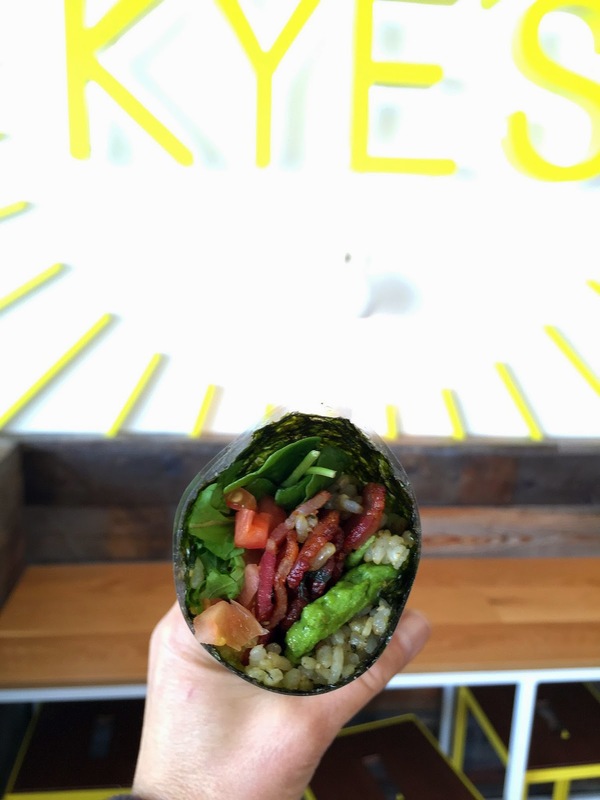 THE UNEMPLOYED EATER: Kye's: Healthy Food That Won't Make You Want To Slit Your Wrists. 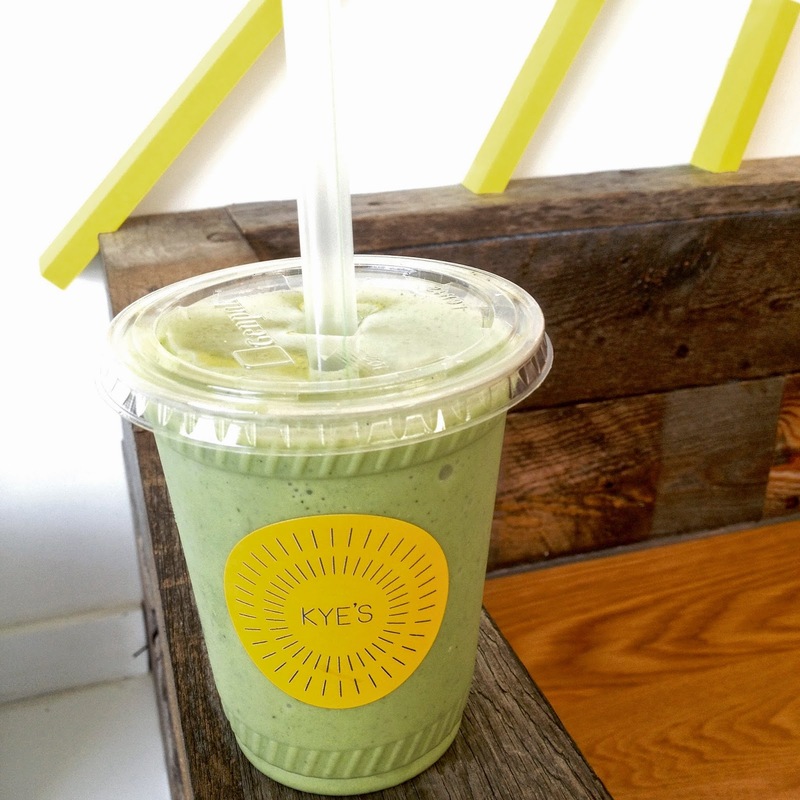 Kye's: Healthy Food That Won't Make You Want To Slit Your Wrists. When people ask me to describe my diet, I have a simple answer, "dude healthy." This usually puzzles the query maker and leads to many more questions about what exactly "dude healthy" entails. Honestly, I don't have a concise response. If you've ever read this blog before you know I certainly go for the glutton. I eat pizza, chicken parms, cake, ice cream, burritos. And LOTS of them. But in between those meals I often eat rather "healthy." Yet, I would imagine my definition of "healthy" varies greatly than say a nutritionist or Natalie Portman's. My "healthy" means mainly low-carb, or, more often, (slightly) more nutritious versions of things that aren't really considered healthy at all. Like In 'n Out Protein Style. Or Cobb Salads. My manliness is satiated, just in a hypothetically healthier form. You know, "dude healthy." Anyway... where the heck am I going with all this? To put it simply: it's not easy to eat "dude healthy." Some restaurants have a dish or two that fit in the spectrum, but very, very rarely does an entire restaurant offer a menu packed with options. Imagine my surprise then when I found such a haven on, of all places, Montana Avenue in Santa Monica, the land of resplendent housewives and perfectly perspiring yogis. Sure, Kye's very much serves some super healthy superfood in a very sleek and modern abode for the aforementioned housewives and yogis (it was packed with such denizens upon my visit), but it also (very surprisingly) caters to the likes of you and me. You know, normies. 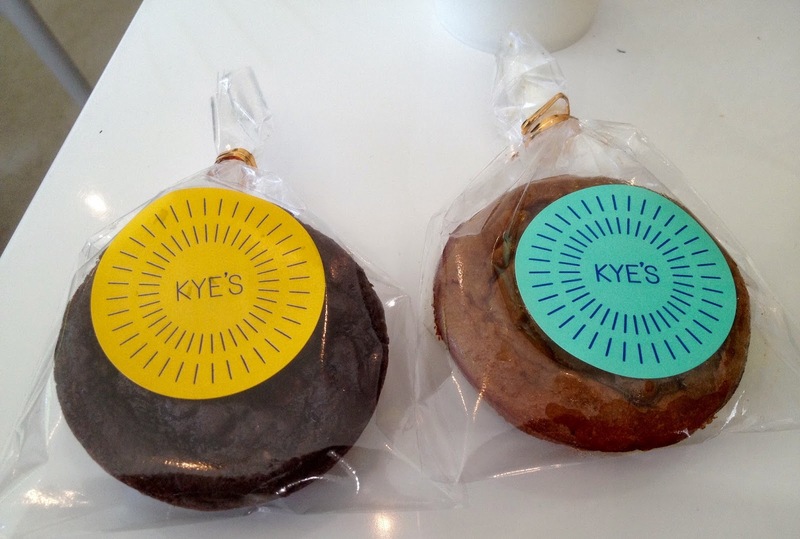 Turns out Kye's owner Jeanne Cheng created the concept out of her own meal dealings at home. Apparently everyone possessed varying dietary restrictions, plus she wanted to sort of trick her son into eating healthy. And bam, Kye's was born. In Cheng's words, "Give people things they love, but a little better for them." The main attraction at Kye's is their namesake, Kyerito. 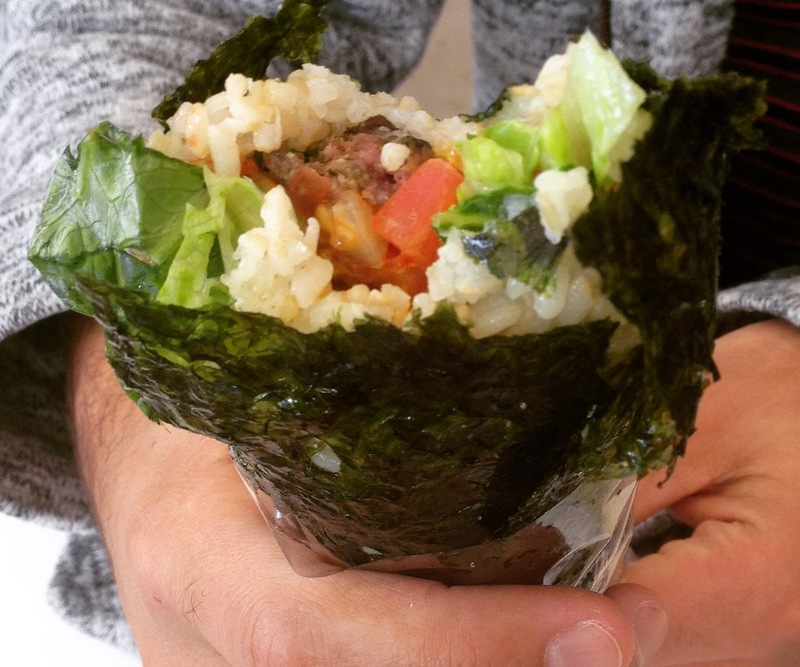 In layman's terms, a healthy burrito, containing of a protein, rice, other fillings and sauce, wrapped in either nori, collard green or romaine lettuce. They offer 15 different varieties, ranging from their "Nori N Lox" to "Bean Taco" to their version of the classic Reuben. All the options, if they don't already, can also be catered to any diet (vegan, vegetarian, Paleo, raw, etc). My dining patron and I bravely tackled four Kyeritos in the name of research - Sweet Chicken (den miso-glazed Mary's Free Range Organic Chicken, broccoli, goji berries, white rice and quinoa blend), The Nori Burger (grass-fed ground beef mixed with chard, nutritional yeast, ketchup, mustard, lettuce, tomato, onion, pickles, brown rice), BBQ Pork (slow-roasted pork shoulder, bbq sauce, poppy seed fennel and cabbage slaw, white rice and quinoa blend) and the Bacon Pesto (local free-range green eggs, Niman Ranch bacon, arugula, tomato, super seed pesto, brown rice). All were fresh, pleasing and filling. I definitely could see one of these push-pop like nutritional burritos serving as a solid breakfast or lunch option. They all provide the protein one hopes for, just hidden amongst a garden of goodies I (and probably others) normally wouldn't come in contact with. For example, goji berries in the Sweet Chicken! What are they doing in there? I don't know. But I didn't hate them. The price is right too ($10-14) - especially for the 'hood. Our two favorites: The Nori Burger and the Bacon Pesto. 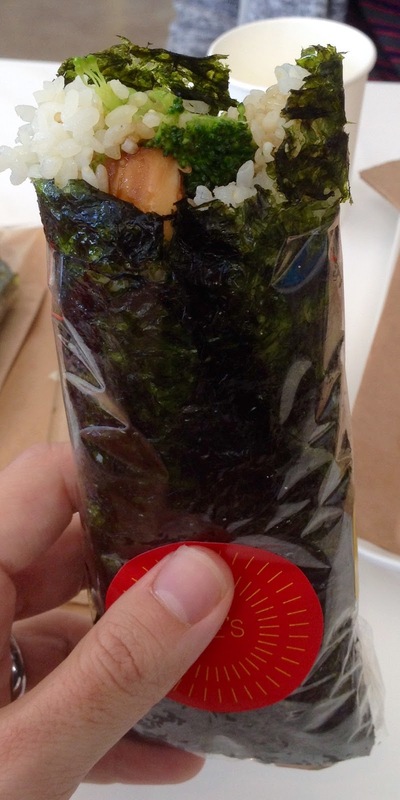 The NB tastes very much like a burger encased in seaweed. However, I don't say that in a bad way. Very much the opposite. You get the burger you crave, yet don't have to feel miserable about it later. The Bacon Pesto similarly offers the ultimate breakfast sandwich experience - minus some of the guilt. If I lived a little closer to Kye's, I could see myself stopping by many a morning to pick one up on the way to the office. 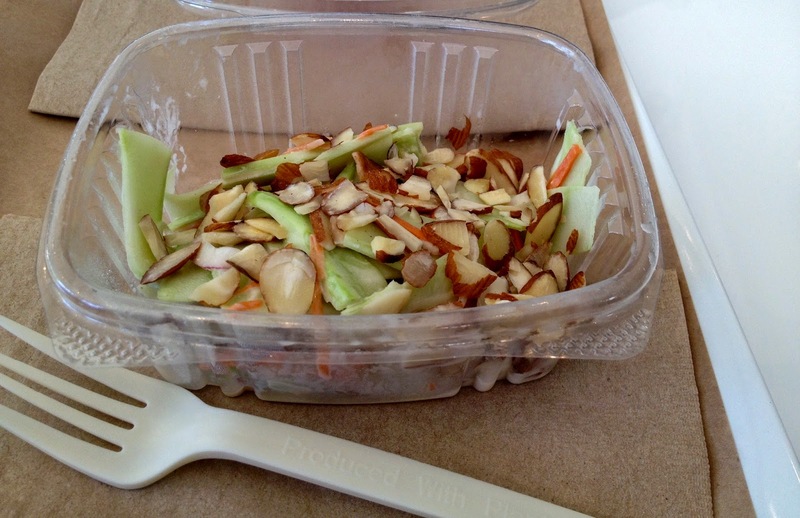 We also sampled the Broccoli Stalk salad, which is about the healthiest sounding thing I've ever put in my mouthpiece, but pretty much tastes like a crunchy, sweet coleslaw. PLUS IT HAS BACON. The Fresh Mint shake (almond milk, mint, spinach, coconut milk ice cream, chinese yam, agave), Black Bean Brownie (black beans, cocoa, maca, sorghum flour, flax meal, sucant, Grade B maple syrup and chocolate chips) and Kabocha Pie (steamed kabocha squash, coconut milk, gluten free flour mix, sucant, cinnamon, ginger, nutmeg, cloves) further successfully tricked me into eating things somewhat healthy, while tasting nothing of the such. The moist and chocolatey Brownie especially stood out. And it's made with friggin' black beans. So, uhh, in conclusion. I like Kye's. And if you're looking to eat a little healthier, but not jump-off-a-building-healthy, I think this is the place for you too. 1518 Montana Avenue, Santa Monica. 7 am - 8 pm daily. Thanks for the love Mike! I really enjoyed reading your review. My husband is totally with you on the "Dude Healthy" food movement! so curious if you can freeze them -- would be great to be able to get a supply for the week. I can take a look at your blog consistently for quite a few hottest posting. This may be a terrific report kudos meant for posting the interesting material. I may see your site repeatedly for current place. The particular Bread Pesto in the same way supplies the best breakfast time hoagie knowledge : less a number of the remorse. Easily were living slightly closer to Key's, I really could notice me personally stopping by several any morning hours to select a single upwards along the way for the business office. I want to be able to spend time, quality time with them all to let them know just how special they are and how I love them so much.